The Moscow metro is relatively safe, but pickpockets, thieves and drunken travellers can spoil an unwary passenger’s mood. Anyone can avoid incidents like these however by following some simple rules. According to statistics from the Directorate of Internal Affairs, 290 robberies took place on the Moscow metro over the course of the first 10 months of 2013. Only 182 of these were solved. For a snatcher the most important thing is surprise: so he (or she) can grab a bag, mobile phone or tablet in the last second before the door closes, jump out of the train and get away. Experts advise to not stand close to the doors, sit in the middle of the carriage and hold onto belongings when the doors are open and never fall asleep under any circumstances. Furthermore with the advent of video cameras life has become much more complicated for a snatcher on the metro. 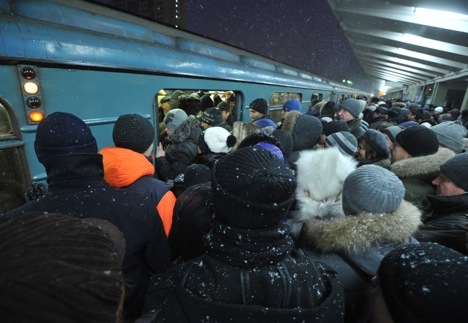 Robbers on the metro normally operate concisely and they have their own places of work – stations with a large number of passengers. Pickpockets work in pairs, transferring the loot between themselves and it is very difficult to catch them with the loot in their possession. It is difficult to pick out a thief in a crowd: they are dressed normally and they could be 15 or 70 years old, women are also found amongst them. Be particularly aware at metro stations close to mainline stations: ‘Komsomolskaya’, ‘Kurskaya’, ‘Paveletskaya’, ‘Belorusskaya’, ‘Kievskaya’, and at large junction stations such as ‘Biblioteka im. Lenina’ and at terminus stations. “Pickpockets usually operate during the rush-hour, when it is quite difficult to track and arrest them,” says the Deputy Chief of Police on the Moscow metro Aleksandr Lipatov. Ian Bird, the Director of an International School in Moscow considers that “Drunks are a serious problem. When we train our staff we encourage them to walk away from a conflict arising from any misunderstanding, especially when it is obvious that the person has been drinking. A foreign language itself can give rise to aggression.” If you notice a drunk, don’t attract their attention say the experts, and if you are in contact with them don’t voice your disapproval. “Think about what you wear in Moscow,” emphasised Lena Shakespeare. “If someone looks like a tourist they are more likely to attract the attention of criminals.” Don’t forget it is not worth sitting in an empty carriage: you could find yourself in company that you don’t want to mix with.